A pterodactyl flying over a cloudy megalopolis... This surrealistic black and white cover picture suits the music very well: light and floating, classy and sober. 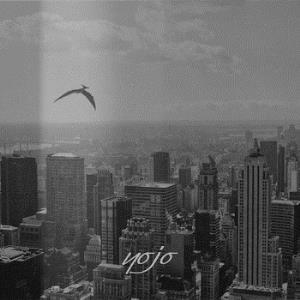 YOJO's promising eponymous debut offers a fluent and clever mixture of post-rock atmospheres with cool jazz, plus a touch of heavy prog for the depressive mood. Instrumental, driven by the trumpet and supported by guitars, this hazy soundtrack well depicts impressions of loneliness and melancholy, the elegant way. Furthermore, the compositions are quite accessible and of constant quality. The suave jazzy "Sundiver" is dark and enigmatic, like if you were wandering through a rainy city, looking at unknown faces. Then the track turns more dynamic. Beautiful! The mournful trumpet describes a desolated landscape all over the slow and changing "VHS", while the ethereal "Pterodactyl" is rather mystical with its raging and floating guitar. Magic! You'll be immersed into an ocean of despair hearing "Captain Kirk Had a Bad Day", and intrigued by a mysterious light through the smoky "Waltz"
Longest title of the album, "Alien" is also the strangest. From a spacey free-jazzy background, the music glows in the dark using changing rhythms and cool bass lines, reminding John Surman at times. Featuring a dialog from David Lynch's "Eraserhead", the gloomy "Aftermath" is quite pleasant, while the heavy progressive "Double Henry" is the rockiest passage of the disc. The ender, "Rough Sleeper", is divided in two sections. The first half is an atmospheric hazy ballad including samples from the monologue "How Should I Live, Angels? ", written and narrated by Russian writer Mikhail Zhvanetsky. The second half turns more towards free jazz and contains this time a speech by Barack Obama. Enjoyable but too long and a little dissonant for my tastes. A band to keep an eye on, very recommended to modern jazzscapes fans!